In Afghanistan, the Taliban announced the official commencement of their annual spring offensive – dubbed Operation Al-Fath – and the group subsequently launched major assaults in several parts of the country. Specific Al-Fath events have been mostly ignored by traditional news sources; the majority are self-reported by the Taliban’s own source, the Voice of Jihad. While there is reason to believe that events reported by Voice of Jihad did in fact occur, fatalities reported by Voice of Jihad in particular are often inflated given the nature of the source; this detail is taken into consideration and the lowest fatality count is recorded when multiple sources report on the same event (for more on this, see our Conflict in Afghanistan methodology report here). ACLED is currently working on covering Voice of Jihad back to 2017 and will be releasing data coded from this source en masse in the coming weeks. While the announcement of the operation was expected by many, there was hope that ongoing peace talks between the Taliban and U.S. representatives would compel the group to delay or limit operations. However, fighting had already increased throughout the country even before the announcement, and both Afghan and foreign soldiers continue to be targeted by explosives and ground assaults. U.S. Special Representative Zalmay Khalilzad called the decision to launch the offensive, despite an apparent momentum in the peace talks, “reckless” (Twitter, 12 April 2019). In March 2019, the Afghan military preemptively launched their own spring offensive – dubbed Operation Khalid – in an effort to eliminate insurgent strongholds, especially in Helmand and Ghazni. Meanwhile, the Taliban themselves have been making recent attempts to gain territory in provinces like Badghis and Kunduz. In the latter, a multi-pronged Taliban assault on the provincial capital was repelled by Afghan security forces on Saturday (Washington Post, 13 April 2019). Elsewhere in Asia, events related to elections stood out in a number of countries, especially in India and Indonesia. In India, the 17th general elections (Lok Sabha) kicked off on 11 April. In the coming five weeks, nearly 900 million voters will vote to fill 543 assembly seats (Economic Times, 13 May 2019). Last week, elections were held in several constituencies in areas vulnerable to election violence including Jammu & Kashmir, Chhattisgarh, Assam, and West Bengal (for more on this, see this ACLED piece). Electoral violence was reported from across the country and left at least 17 people dead last week. 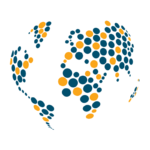 Electoral violence includes armed clashes between state and rebel groups, clashes between political parties, and targeted attacks on rival party workers or candidates. Rebel violence reportedly left ten people dead. A Bharatiya Janata Party (BJP) lawmaker and four of his security details were reportedly killed in an attack by Maoist rebels in Chhattisgarh’s Dantewada district. Meanwhile, a Rashtriya Swayamsevak Sangh (RSS) worker and his security detail were shot dead by suspected militants in Kishtwar town of Jammu & Kashmir. Also in Jammu & Kashmir, a youth was reportedly killed in clashes between rioters and state forces during voting in Pulwama district while Border Security Forces (BSF) were allegedly involved in coercing voters to vote for the BJP. With general elections scheduled for 17 April in Indonesia, several rallies were held by presidential candidates. In Yogyakarta, upon returning from a rally, a Prabowo supporter was attacked by unidentified assailants with an airsoft gun; as well, supporters of Widodo threw stones at the Islamic Defenders Front (FPI) regional headquarters during a march to a rally. During a rally in West Java, members of the United Development Party (PPP) rioted before being dispersed by police. Protests were held in Thailand related to the election in March, the results of which have yet to be clarified. With the Election Commission having filed a police report against activists organizing a petition calling for its dismissal, activists gathered at Victory Monument in Bangkok on 7 and 11 April. Meanwhile in Bangladesh, political violence – especially factional clashes between members of the ruling Awami League and its front organisations – decreased significantly following a surge in reported events during and in the aftermath of the upazila (sub-district) chairman elections in previous weeks. 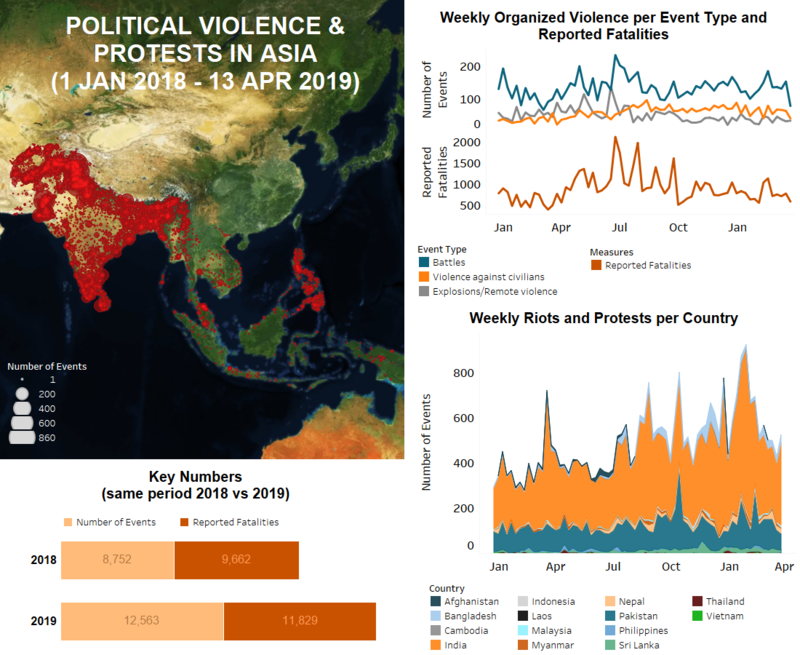 In other developments, organized violence involving domestic rebel groups continues to occur in several Asian countries, including a surge in explosions and remote violence in Pakistan. At least 21 people died in a sectarian attack against the minority Shia Hazara community when an alleged Tehreek-i-Taliban Pakistan suicide bomber detonated inside a vegetable market in Quetta city, Balochistan province. Three more incidents of explosions and remote violence targeting both civilians and security personnel were reported in Balochistan and Khyber Pakhtunkhwa provinces last week, reportedly killing two more civilians. In the Philippines, deadly clashes between the military and Abu Sayyaf Group (ASG) occurred with 12 members of the group reportedly killed in one day in Sulu province. There were five fatalities reported in additional battles in Sulu and Basilan provinces. Likewise, clashes between the Philippine military and New People’s Army (NPA) led to six reported fatalities last week. In Myanmar, battles between the military and Arakan Army (AA) continued and were particularly heavy on 9 and 10 April after the AA attacked a police station in Mrauk-U township. The AA claims the military has used it as a base from which to fire weapons. Fighting between the two groups also occurred in Paletwa township in southern Chin state last week. In Thailand, separatist violence continued in the deep south with one off-duty ranger reportedly killed in Narathiwat and one defense volunteer reportedly killed in Pattani.